Can Chicks Migrate Without Following Ultralight Planes? 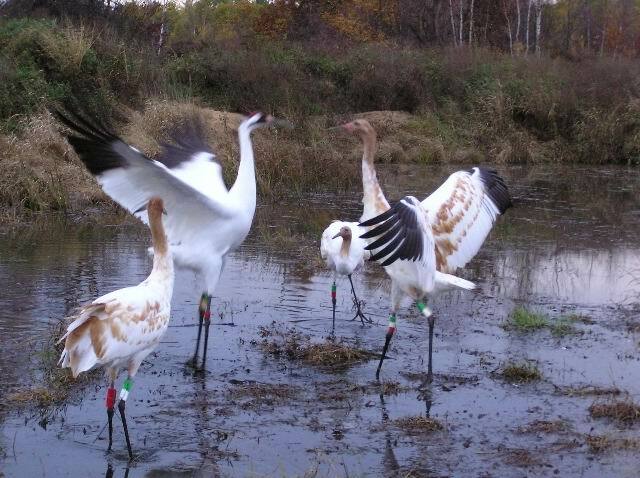 A new generation of Eastern Migratory Whooping cranes takes flight each fall. Since 2005 some of them became part of the flock through direct release: being released in the company of older cranes to follow them south and thereby learn the migration route. These chicks are called Direct Autumn Release (for short called "DAR") birds. Each year more DAR chicks join the new Eastern flock. It's another way experts hope to increase the new flock's numbers. What is Direct Autumn Release? 1. Raising captive-bred whooping crane chicks by the costume/isolation-rearing protocol. 2. Releasing these chicks in the company of older whooping cranes that have successfully migrated in the past. The DAR chicks learn the fall migration route by following the older birds. How Are DAR Chicks Prepared for Migration? The chicks for direct autumn release are hatched and raised for a month at ICF’s isolation-rearing facility in Wisconsin. DAR chicks are under the care of chick-rearing specialist Marianne Wellington and other experts. Hidden under white costumes, they raise the chicks with the help of crane puppets. This is called costume rearing. The chicks are raised in isolation, away from any sights or sounds of humans. Around one month of age—and before they can fly—the birds get transported by van to their release site. Untill fall 2011 it was Necedah NWR. In fall 2011, the birds were brought to Horicon Marsh State Wildlife Area (soon to become Horicon Marsh National Wildlife Refuge). They spend the remainder of the summer there, under the watchful eyes and supervision of costumed staff from ICF and the U.S. Fish and Wildlife Service. The chicks will be near other whoopers in the Eastern flock. They will be near many sandhill cranes that migrate south too. In autumn, these wild cranes will become their "teachers" for migration. Chicks fledge when they are around 70 days old. They are allowed to roam freely during the daytime — with Marianne and other costumed "parents" checking on them. They spend the nights in a night pen with food in the marsh so they are safe from predators. When the chicks have grown into juvenile birds about five months old, they are released in the company of older cranes after fledging, or developing their flight feathers. (Most of the older Whooping Cranes have previously followed the ultralight aircraft on their first migration). The DAR chicks are set free so they can hang out with these older cranes that will soon be migrating. Will the older cranes help the new DAR chicks learn the way to Florida? That's the plan! In 2005 and 2006, 4 Whooping Cranes were released each year using this method. In 2007, 10 DAR chicks were released. In 2008, six DAR chicks plus male #810 from the ultralight class were released. In 2009, nine DAR chicks were released and 11 chicks are being raised for release in 2010. Until fall 2010 DAR chicks were named with a different numbering system than ultralight-led chicks to helpkeep them distinct from the chicks that follow the ultralight. Starting in 2010, all DAR chicks and ultralight chicks have their birth ORDER number first, followed by a dash and their YEAR of birth. The costumed staff also give fond nicknames to each DAR chick. • Chicks in the wild learn migration from their parents, so the Direct Autumn Release (DAR) method is getting closer to the ways of nature. Make a 3-column chart to compare (1) the DAR migration, (2) the ultralight-led migration, and (3) the wild birds' migration. • To learn more about the DAR project, see the November/December 2007 issue of Audubon Magazine and read "Breakout" by author Phil McKenna.